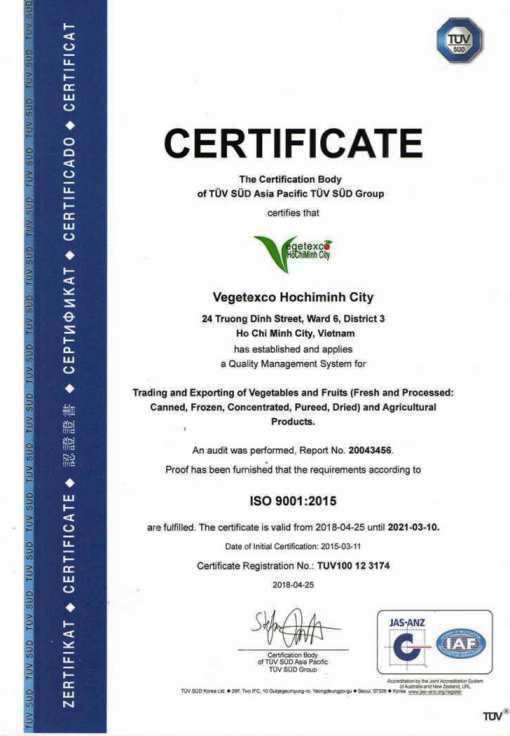 Founded in 1976, VEGETEXCO HOCHIMINH CITY is dedicated to bringing Vietnamese fruits, vegetables, agricultural products to the world. Since then, the company has gained experience in developing a wide range of high quality products, including dried, canned, IQF, concentrated and puree fruit, as well as in expanding markets in Asia, Europe and the Middle East. We are committed to building reliable partnerships in the fruit and agricultural product business. Range: Vegetables and Fruits (Fresh and Processed : Canned, Frozen, Concentrated, Pureed, Dried) and Agricultural Products. Reference: TUV SUD ASIA PACIFIC TUV SUD GROUP. KOREA Ltd.